I am developing the idea of studio as laboratory and extending previous versions by inviting members of the public to be involved in the process and the experiments. The studio will also have live CCTV broadcast and live data feeds. Artists are like scientists they ask questions and find answers in peculiar ways….guided by research and process development. Most artists, like scientists do stuff, they make things to question the world. They often speculate, researching difficult issues in a general direction in the way they see it with specific outcomes, these outcomes may or may not be art. From the real to virtual and back to the real is a theme that has had my attention for five years and the idea is embedded in the works I am currently making. 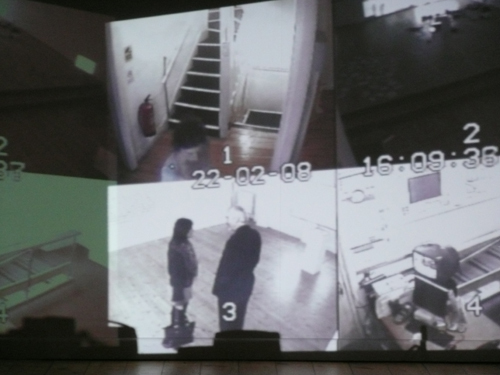 Image: Stanza installation:- “Visitors To A Gallery” 2008. CCTV artwork. This project will take place in the Barn at Lanternhouse, as Stanza creates data scapes in an Open Studio. The residency is about exploring the artistic process, being transparent about the process and the development and production of new work. The “open studio” mirrors the process of the project, with material and philosophical process being available to witness throughout. Image: Stanza installation:- “Visitors To A Gallery” 2008. Installation on Floor. This work (the studio as lab) is now in version three for my residency in Lanternhouse International (UK) called City of Dreams.